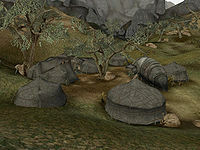 The Zainab Camp is located on the western edge of the Grazelands region, southwest of Vos and south of the Dwemer ruins of Nchuleft. From here, the Zainab control the southern Grazelands. The camp's Ashkhan is Kaushad and the resident Wise Woman is Sonummu Zabamat. During the main quest, Ashkhan Kaushad requests that you take care of a vampire who has taken up residence in a nearby ancestral tomb and then to help him acquire a high-born Telvanni bride in order to win his support as the Zainab Nerevarine. The Zainab Camp has three resident traders: Ashibaal, who trades solely for the Zainab Camp, and Ashur-Dan and Ababael Timsar-Dadisun, who willingly trade with outsiders. Ababael and Ashur-Dan both offer Blacksmith services and Ababael is a master trainer in Mercantile. Ababael also provides training in Armorer and Long Blade. 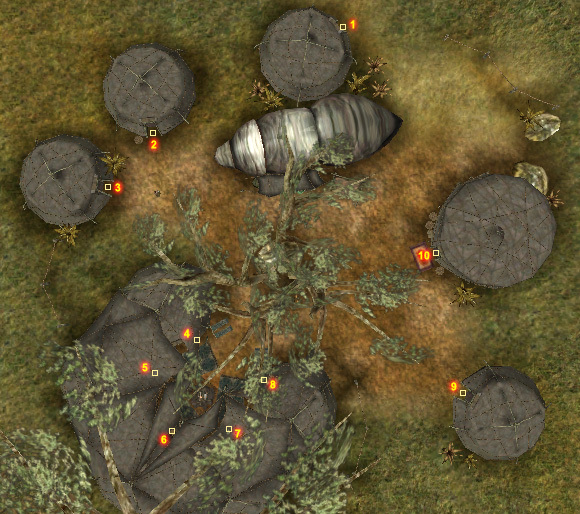 The resident healer is Tussi, who also has a variety of potions and ingredients for purchase. Note that killing any of the members of the Zainab Tribe will anger the tribe and prevent you from completing the Zainab Nerevarine quest, an essential part of the Main Quest.